Djibouti is a country in Northeast Africa. Approximately 90% of Djibouti's land is desert. The official name of the country is the Republic of Djibouti. On Mt. Goda there is vegetation growing that is rare for the Djibouti region. Here wild olive trees, acacias, and giant juniper trees can be found growing. The rest of Djibouti's land has mostly typical desert vegetation such as palm trees and thorn scrubs. It is bordered by Eritrea in the north, Ethiopia in the west and south, and Somalia in the southeast. The remainder of the border is formed by the Red Sea and the Gulf of Aden at the east. Other agriculture includes goat, camel, and sheep farming. Djibouti has two official languages: Arabic and French. Industry in Djibouti includes salt, agricultural processing, and construction. As of 1 January 2017, the population of Djibouti was estimated to be 905,618 people. Djibouti has natural resources such as gold, clay, petroleum, salt, marble, limestone, pumice, gypsum, and granite. It is the 146th largest country in the world in terms of land area with 23,200 square kilometers (9,000 square miles). Common exports from Djibouti include animal hides, and coffee. Djibouti City is the capital and largest city of Djibouti, which is named after it. It is located in the coastal Djibouti Region on the Gulf of Tadjoura. The city is known for its 19th-century architecture and the port at the entrance to the Red Sea. Common imports into Djibouti include beverages, food, petroleum products, chemicals and transportation equipment. While agricultural land is scarce at only 0.09% of Djibouti's total land area, it is possible to grow some fruit and vegetable crops. Djibouti's major trading partners include Indonesia, China, Somalia, Saudi Arabia, Yemen, and India. The country is situated in the Horn of Africa (peninsula in Northeast Africa). 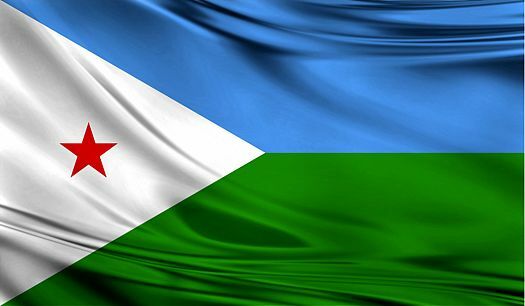 Djibouti gained its independence from France on June 27th, 1977. June 27th each year is celebrated as the country's Independence Day. The monetary unit in Djibouti is the Djibouti franc. Mousa Ali is a 2,021 meters (6,631 feet) stratovolcano located on the tri-point of Ethiopia, Eritrea and Djibouti. The volcano is the highest point in Djibouti. Djibouti has five regions including the Ali Sabieh Region, the Arta Region, the Dikhil Region, the Djibouti Region, the Obock Region, and the Tadjourah Region. Djibouti's population is approximately 810,000. Djibouti is a very warm region, with summer temperatures reaching 106 degrees Fahrenheit. In the winter in some areas the temperature can drop to freezing. About 90 percent of Djibouti’s terrain is flat, barren desert land made up of volcanic rock. Although Djibouti is mainly desert, it is still home to diverse wildlife including 455 fish species, 40 reptile species, 3 amphibian species, 66 mammal species, 360 bird species, and 493 invertebrate species. The desert terrain of Djibouti is broken in places by salt lakes. The largest of these is Lac Assal [photo below] at 155 meters (509 feet) below sea level, it is the lowest point in Africa and the second-lowest elevation in the world. It is also the world’s saltiest body of water, with a concentration surpassing even that of the Dead Sea. Its water reaches temperatures of up to 57°C (135°F) in the summer. Djibouti cuisine is commonly made with Middle Eastern spices such as cinnamon and saffron. Common dishes include yetakeit wet (spicy stew), Fah-fah (spicy beef soup), and halva (a type of sweet). Djibouti's unemployment rates are very high - almost 60% in urban areas and 80% in rural areas. The country’s flora and fauna live in a harsh landscape with forest accounting for less than one percent of the total area of the country. The Danakil Desert is a lowland geothermal region which covers much of western Djibouti. The Danakil Desert extends into Ethiopia and Eritrea. The area is known for its volcanoes and extreme heat, with daytime temperatures surpassing 50 °C (122 °F). The Danakil Desert is one of the lowest and hottest places on Earth. Djibouti allows for freedom of religion but 94% of its residents are Islamic, with the remaining being Christian. Approximately 60% of Djibouti's population is Somali, 35% is Afar, and the remaining 5% is made up of French, Italian, Arab, and Ethiopian people. Djibouti has 314 kilometers (195 miles) of coastline. Much of the coastline consists of white and gold, sandy beaches. The two official languages of Djibouti are French and Arabic. Other languages spoken include Somali and Afar. There are three national parks in Djibouti: Day Forest National Park, Djibouti National Park and Yoboki National Park. It protects an important forest island in a sea of semi-desert and deserts of Afar region. Day Forest National Park, also known as Forêt du Day National Park, is a national park in the Goda Mountains of Djibouti. This isolated forest is surrounded by endless semi-deserts and deserts of Afar region. This is the largest forest in Djibouti. The forest has a total area of approximately 13,900 hectares (34,350 acres). The name Djibouti is derived from the word 'gabouti' - a doormat made from palm fibers. The Aquarium Tropical de Djibouti is one of the country’s top tourist attractions. Located in the historic part of Djibouti City, it’s considered one of the best in all of Africa. It’s designed so that you feel like you’re underwater in the Red Sea, getting a firsthand look at marine life in this unique body of water. The Republic of Djibouti's capital city is also called Djibouti. The Djibouti area has been inhabited since at least the Neolithic. Pottery predating the mid-2nd millennium has been found at Asa Koma, an inland lake area on the Gobaad Plain. In antiquity, the territory was part of the Land of Punt and then Sabean and Axumite rule. The Djibouti area, along with other localities in the Horn region, was later the seat of the medieval Adal and Ifat Sultanates. In the late 19th century, the colony of French Somaliland was established following treaties signed by the ruling Issa Somali and Afar Sultans with the French. It was subsequently renamed to the French Territory of the Afars and the Issas in 1967. In 1977, the Djiboutian people voted for independence, officially marking the establishment of the Republic of Djibouti. Djibouti covers an area of 8,486 square miles in the Horn of Africa. The economy of Djibouti is derived in large part from its strategic location on the Red Sea. Its port is the lifeblood of its economy, providing the biggest source of income and employment in this otherwise barren country. Djibouti’s climate is significantly warmer and has significantly less seasonal variation than the world average. Mean daily maximum temperatures range from 32 to 41 °C (90 to 106 °F), except at high elevations, where the effects of a cold offshore current can be felt. According to the country profile related to biodiversity of wildlife in Djibouti, the nation contains more than 820 species of plants, 493 species of invertebrates, 455 species of fish, 40 species of reptiles, 3 species of amphibians, 360 species of birds and 66 species of mammals. The Djiboutian Franc is the official currency of the state. Football is the most popular sport amongst Djiboutians. Khat chewing is common in Djibouti. Khat is a flowering plant and contains the alkaloid cathinone, an amphetamine-like stimulant, which is said to cause excitement, loss of appetite, and euphoria. The World Health Organization (WHO) classified it as a drug of abuse.